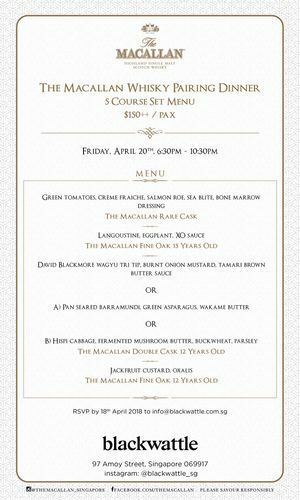 The Macallan teams up with Blackwattle for a one-night-only epicurean experience this April. The newly-open Australian restaurant prides itself on fine dining without pretences, opting to let the integrity of the ingredients speak for themselves. The selection of fine whiskies from The Macallan, which includes the Double Cask, Fine Oak and Rare Cask, seeks to further alleviate the dishes. Starting off strong with The Macallan Rare Cask, it is by no coincidence that the bold flavours are set to complement the bone marrow dressing with green tomatoes, crème faiche and salmon roe. Other delightful pairings for the evening include The Macallan Fine Oak 15 Years Old with Langoustine and eggplant in XO sauce; and The Macallan Fine Oak 12 Years Old with Jackfruit custard and oxalis. RSVP by 18th April to info@blackwattle.com.sg.